Marianna Health & Wellness, P.A. - Chiropractor In Marianna, FL, USA :: Cox Technic may be the solution for back-pain specialists. Cox Technic May Be The Solution For Back Pain Specialists. Cox Technic may be the solution for back-pain specialists. The public, for its part, thinks of chiropractors as treating back pain, spinal, and musculoskeletal issues.3 Nearly 60 percent report being highly satisfied with chiropractic care compared to other back-pain care providers.1 The public recognizes chiropractic physicians as spine specialists. With this in mind, one approach doctors may choose is Cox Technic, a chiropractic method for relieving back pain that is supported by research, published outcomes, and an established system of care. Since its inception nearly 50 years ago, Cox Technic (initially coined “flexion distraction” by its founder, James M. Cox, DC, DACBR) has been fashioned by research. Cox continues to gather, produce, and share spine research with those who wish to make use of it. Two federally funded biomechanical studies have recently been completed, one by the U.S. Department of Health and Human Services (Health Resources and Services Administration) on cervical outcomes and one by the National Institutes of Health on lumbar outcomes (Figure 1).13 These findings were in alignment with previously published research. A cervical spine case review of 39 patients found that a mean of 13.2 visits produced maximum improvement and lowered Neuropathic Pain Scale (NPS) scores from 50.1 to 8.7, a statistically significant 41.4 drop in reported pain.12More case reports about flexion distraction for spinal stenosis,14-16 spondylolisthesis, 17,18 Klippel Feil,19 disc herniation,20,21 pregnancy-related back pain,22 pelvic pain,23,24 spine-related testicular pain,25 and sciatic and cervical radiculopathy26 share details of how the Cox Technic system of care produces relief. The system of care for Cox Technic is based on a decision-making algorithm: Is the patient a Protocol I-(radiculopathy) or Protocol II- (non-radiculopathy) type patient? Protocol I patients receive manual flexion distraction delivered with flexion or long-y-axis. Protocol II patients receive full range-of-motion adjusting to each vertebral segment as clinically indicated. The adjustment is smooth, gentle, and safe. Beginning always with tolerance testing, treatment proceeds with gentle motion to the affected segment(s), never with hand contact below the disc herniation. The system is patient-centered, from diagnosing the condition to patient tolerance testing to the treatment itself. Patients also need to understand the expected relief outcomes the treatment plan is intended to provide. Most patients appreciate this goal because 50 percent relief can often get them back to the quality of life they desire. Many others go through various forms of conservative medical and other modalities of care without reaching this level of improvement. The 50-percent rule permeates the treatment plan: Protocol I is applied until 50 percent relief is noted (both subjectively and objectively), then Protocol II is introduced after tolerance testing. Office visits also follow this rule. For example: A patient with severe radiculopathy may be seen daily until reaching a 50 percent reduction in pain, at which point the number of visits are cut in half. Then the patient is seen every other day. At the next 50 percent relief threshold, the visits are again cut in half. Encourage patients to take an active role in their care by exercising, coming to appointments, and complying with other instructions to maximize results and obtain the desired level of rehabilitation. Often, to get patients on board with care, you can share published cases and research articles with them. Patients today are sharp; they do their homework and their due diligence. They expect results from their healthcare providers. As chiropractic physicians and recognized back-pain specialists, certified Cox Technic physicians rely on evidence-based protocols to produce research-documented results. This is a key aspect of being a back-pain specialist. 1 Editors. “Relief for Your Aching Back: What Worked for our Readers.” Consumer Reports.March 2013.http://consumerreports.org/cro/2013/01/relief-for-your-aching-back/index.htm. Accessed April 3, 2014. 2 Buchbinder R, Blyth FM, March LM, et al. Placing the global burden of low back pain in context. Best Pract Res Clin Rheumatol. 2013;27(5):575-89. 3 Editors. “Chiropractic Care for Back Pain.” Medline Plus.www.nlm.nih.gov/medlineplus/ency/patientinstructions/000416.htm. Updated Oct. 18, 2011. Accessed April 3, 2014. 4 Gudavalli MR. Estimation of dimensional changes in the lumbar intervertebral foramen of lumbar spine during flexion distraction procedure. Proceedings of the 1994 International Conference on Spinal Manipulation. June 10-11, 1994; Palm Springs, Calif.; 81. 5 Gudavalli M.R. Dimensional changes in the lumbar intervertebral foramen under combined loads of flexion and traction. Adv Bioeng. 1994;28:91-92. 6 Cox JM. (2011). Low Back Pain: Mechanism, Diagnosis, Treatment. 7th ed. Philadelphia: Lippincott Williams and Wilkins: Chapter 6. 7 Cox, JM, Feller JA, Cox JA. Distraction Chiropractic Adjusting: Clinical Application, Treatment Algorithms, and Clinical Outcomes of 1000 Cases Studied. Topics in Clinical Chiropractic. 1996;(3)3:45?59, 79?81. 8 Gudavalli R, et al. A randomized clinical trial and subgroup analysis to compare flexion-distraction with active exercise for chronic low back pain. European Spine Journal. 2006;15(6):1070-82. 9 Gudavalli R, Cambron J, Long C, et al. A randomized clinical trial comparing conservative medical care, chiropractic cervical distraction care, and a combination of both for chronic neck pain. Presentation at World Federation of Chiropractic; June 16-18, 2005; Sydney, Australia. 10 Cambron JA, Gudavalli M, McGregor M, et al. Amount of health care and self care following a randomized clinical trial comparing flexion-distraction with exercise program for chronic low back pain. Chiropractic & Osteopathy.2006;14:19. 11 Cambron JA, Gudavalli MR, Hedeker D, et al. One year follow up of a randomized clinical trial comparing flexion distraction with an exercise program for chronic low back pain. J Altern Complement Med. 2006;12(7):659-68. 12 Schliesser JS, Kruse RA, Fleming Fallon L. Cervical radiculopathy treated with chiropractic flexion distraction manipulation: a retrospective study in a private practice setting. J Manipulative Physiol Ther. 2003;26(9):E19. 13 Gudavalli R, Potluri T, Carandang G, et al. Intradiscal Pressure Changes during Manual Cervical Distraction: A Cadaveric Study. Evidence-Based Complementary and Alternative Medicine. 2013; Article ID 954134.http://dx.doi.org/10.1155/2013/954134. 14 Gudavalli S, Kruse R. Foraminal stenosis with radiculopathy from a cervical disc herniation in a 33?year?old man treated with flexion?distraction decompression manipulation. J Manipulative Physiol Ther. 2008;31(5):376?380. 15 Snow G. Chiropractic management of a patient with lumbar spinal stenosis. J Manipulative Physiol Ther.2001;24(4):300?304. 16 DuPriest CM. Nonoperative management of lumbar spinal stenosis. J Manipulative Physiol Ther. 1993;16(6):411?4. 17 Cox JM, Trier K. Chiropractic adjustment results correlated with spondylolisthesis instability. J Man Med.1991;6:67?72. 18 Dunn AS, Baylis S, Ryan D. Chiropractic management of mechanical low back pain secondary to multiple?level lumbar spondylolysis with spondylolisthesis in a United States Marine Corps veteran: a case report. J Chiropr Med.2009;8(3):125?30. 19 Kruse RA, Schliesser J, DeBono VF. Klippel?Feil Syndrome with radiculopathy. Chiropractic management utilizing flexion?distraction technique: A case report. J of the Neuromusculoskeletal System. 2000;8(4):124?31. 20 Guadagnino MR. Flexion?distraction manipulation of a patient with a proven disc herniation. J of the Neuromusculoskeletal System. 1997;5(2):70?73. 21 Morris CE. Chiropractic rehabilitation of a patient with S1 radiculopathy associated with a large lumbar disk herniation. J Manipulative Physiol Ther. 1999;22(1):38?44. 22 Kruse R, Gudavalli S, Cambron J. Chiropractic treatment of a pregnant patient with lumbar radiculopathy. Journal of Chiropractic Medicine. 2007;6(4):153?158. 23 Browning JE. The mechanically induced pelvic pain and organic dysfunction syndrome: an often overlooked cause of bladder, bowel, gynecologic, and sexual dysfunction. J of the Neuromusculoskeletal System. 1996;4(2):52?66. 24 Hawk C, Long C, Azad A. Chiropractic care for women with chronic pelvic pain: a prospective single?group intervention study. J of the Neuromusculoskeletal System. 1997;20(2):73?9. 25 Rowell RM, Rylander SJ. Low?Back Pain, Leg Pain, and Chronic Idiopathic Testicular Pain Treated with Chiropractic Care. J Altern Complement Med. 2012;18(4):420-2. doi: 10.1089/acm.2010.0698. Epub ahead of print; April 10, 2012. 26 Kruse RA, Imbarlina F, DeBono VF. Treatment of cervical radiculopathy with flexion distraction. J Manipulative Physiol Ther. 2001;24(3):206?209. 27 Haugen AJ, Grovle L, Brox JI, et al. 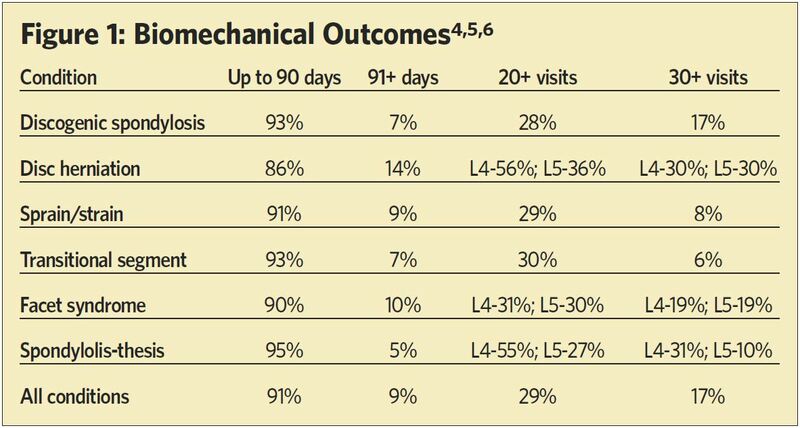 Estimates of success in patients with sciatica due to lumbar disc herniation depend upon outcome measure. European Spine Journal. 2011;20(10):1669-1675.